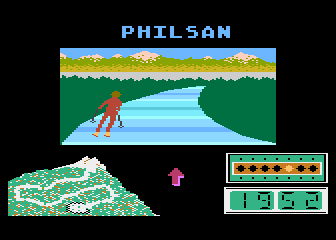 When I bought my first Atari 800XL, in 1984, I immediately realized to have in my hands not only a good “game machine” but also a powerful ‘didactic’ instrument to learn. I enjoyed myself with several good games published in the first half of the 80’s and then, I started to program with the excellent Basic available on the Atari 8 bit trying to explore and exploit the graphic and the sound of my machine. Italian books or magazines were almost not existing and, obviously, Internet was far to be a solution… I didn’t stop in my passion and, with many difficulties, I was able to get some documents in English from the USA. 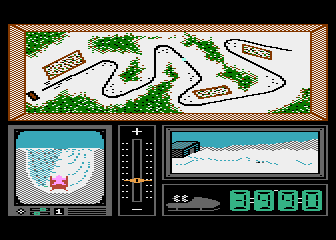 In those years it was very popular “Winter Games” by Epyx but, unfortunately, it didn’t exist an Atari version. 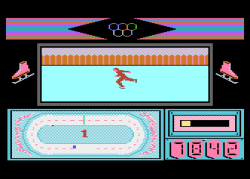 For this reason I decided to try to convert the Ski Jump event and to show my creation to Lindasoft, a mythical Italian software house supporting the 8-bit world. The meeting was very positive and they asked me to complete an ‘Atarian’ version of winter games. 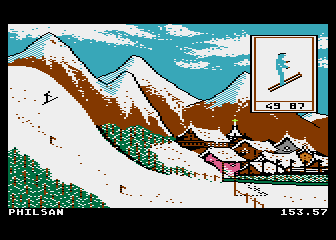 I finished the game and it was published (obviously without the Ski Jump event, too similar to the original from Epyx) but, due to the Italian Atari market, based mainly on systems connected with cassette recorders, Lindasoft decided to sell it only on tape... a multi-event game is conceptually made to be run by diskette and the cassette version was not a good idea. 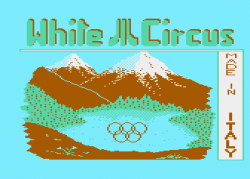 White Circus is a multi-event sport game, it runs on all Atari 8-bit systems and it gives you the opportunity to compete with your friends in 5 different winter disciplines. currently my English is very far to be perfect, but it was absolutely terrible when I was a boy, so I beg your pardon for any text error in the game. Welcome, it's always nice to see a lost game recovered. Welcome to the forum Andrea! What a wonderful way to introduce yourself: a nice story and a lost game! Thanks for the kind words regarding my website, the first and only Italian language one dedicated to A8. I am proud of it in particular for the page where I am saving Italian language manuals, books, magazines, ads. Edited by tjlazer, Wed May 1, 2013 9:09 PM. Cant wait to try this. Congrats on fulfilling your original dream. I'm glad to see White Circus Is not as racist as I thought it was going to be when i read the title. 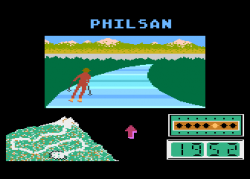 I was always dissapointed when Epyx did not do a A8 version, so this is most welcome! you have a new game for the 8-bit high Score Club! time to try a "new" A8 game ! You're right, my friend ! I assume the name is just a translation issue. Would Summer Games be "Brown Circus"? Or maybe "Green Circus". Edited by R.Cade, Fri Dec 1, 2017 5:28 PM. I don’t know. “Green Circus” is a pretty apt metaphor for the Olympics these days. I had a chance to try this out today. Very nice! It is a welcome addition to the A8 library. Thank you for sharing it with us!